There are UFOs whose powerful lights have caused highway accidents in the Yucatan. One of them ocurred five years ago on the Tizimín-Calotmul highway. 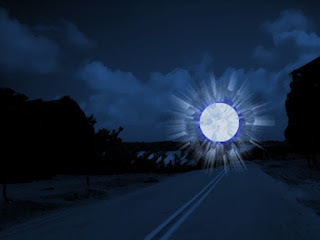 MERIDA, Yucatan - Strange though it may seem, a driver from the Yucatan claims having been driven off the Tizimin-Calotmul highway after seeing a UFO with a powerful beam of light in front of him. He was blinded and forced to skid off the road. "At the time I traveled once a week to the eastern part of the state to sell cleaning products. I remember well that it was a Tuesday, around nine o'clock at night. I was on my way to Calotmul when I suddenly saw a powerful light coming toward me in the distance. I thought it was a trailer. However, it was on me in a minute. It was so bright that I made a hard turn off the road. All I remember is that it rose into the air as it approached, making no noise whatsoever," he said. "Fortunately, I didn't fall into a ditch and nothing happened to my car, since I was driving slowly. It took me weeks to say anything about it because I know that no one would believe me. It didn't ocurr to me, in fact. Neither my wife nor relatives beleived me. It's only been now that I decided to go public, although perhaps no one will believe me now."